As we told you in our post last year regarding Android overtakes iPhone by 2013, It seems that we were correct that time and now it seems that Android overtakes iPhone in early 2011. 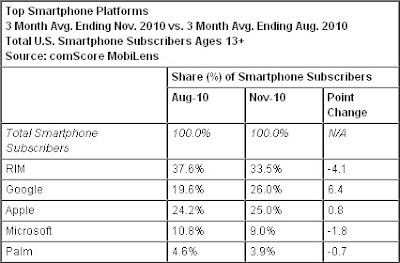 61.5 million people in the US owned smartphones during the three months ending in November 2010, up 10 percent from the preceding three-month period. For the first time, more Americans are using phones running Google's Android operating system than Apple's iPhone, but RIM's BlackBerry is still in first place, according to comScore. RIM fell from 37.6 percent to 33.5 percent market share of smartphones, Google captured second place among smartphone platforms by moving from 19.6 percent to 26.0 percent of US smartphone subscribers, and Apple slipped to third despite its growth from 24.2 percent to 25.0 percent of the market. Microsoft, in fourth place, fell into single digits from 10.8 percent to 9.0 percent while Palm was still last and further slipped from 4.6 percent to 3.9 percent. What you have to say about this? Speak in comments!